You avoid most of the duties required of a bankrupt like reporting your monthly income and expenses. Instead, a consumer proposal is a formal debt repayment arrangement made with your creditors and administered by a Licensed Insolvency Trustee acting as the Consumer Proposal Administrator. You agree to repay a portion of what you owe and your creditors agree to eliminate your total debt once you are finished your proposal. Any insolvent person in Canada who owes less than $250,000, excluding their mortgage, is eligible to file a consumer proposal to deal with their debts. At your initial assessment, the trustee will look at what you own and your income. This determines how much you might have to pay if you were to file for bankruptcy. The trustee will calculate an estimate of what your creditors would receive if you were to file for bankruptcy. This includes both the value of any assets you would surrender, like equity in your home, and any potential surplus income payments you might need to make if you filed bankruptcy. Your creditors will expect to receive slightly more than that amount in total as a debt proposal so this is the starting point in determining your payment plan. Then, the trustee will talk to you about your budget. He or she will review your monthly cash flow with you, ignoring your current unsecured debt payments since these will stop once you file a proposal. From this information, they’ll help you determine how much you can afford to pay each month. 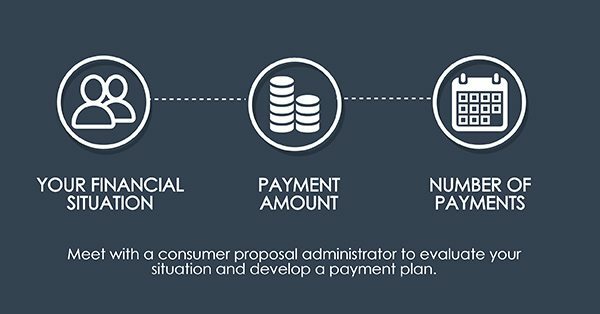 A proposal is only successful if you can keep up with the monthly payments which is why this is an important part of the process. With your total payment and your monthly available cash flow in mind, the trustee will help you determine a payment plan. Proposal payments can be spread over a maximum of 60 months. If you can afford more each month, you can shorten your proposal term. You can even offer a lump sum if you have access to money through a relative or potential windfall. One final note: The cost of a consumer proposal is covered by your agreed upon proposal payments. 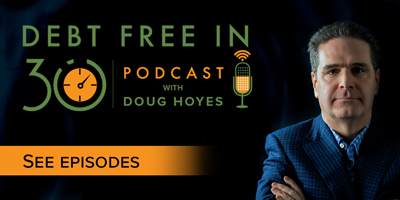 There is no upfront fee and no separate charge. The trustee is paid out of the funds distributed to the creditors. Mark owes $45,000 in credit card and other unsecured debts. He owns a home with $4,000 in equity (after paying all potential selling costs) and his household income is $4,000 a month. Mark is married and has one child. With this information the trustee determines that Mark’s potential bankruptcy costs would be $13,600. This includes the equity value in his home and potential surplus income payments. In this scenario, Mark could make an offer to pay his creditors $15,000 rather than file for bankruptcy. If he pays this amount over the maximum 5 years, his payments would be $250 a month. Mark decides he can afford to pay $500 a month which means he can actually complete his proposal in 30 months. The end result of all this is that Mark pays back only $15,000 of his original $45,000 in debts and he pays no interest. If you’re wondering what your possible payment plan could be based on average settlements try our consumer proposal calculator. Filing a consumer proposal is done after you determine your proposal terms. Once you sign your proposal documents, they’ll be electronically filed with the government and you immediately gain protection from your creditors. This means, all wage garnishments and legal actions stop and you no longer make payments to your unsecured creditors. Your consumer proposal is automatically approved unless more than 25% of your creditors request a meeting of creditors. In most cases, there will not be a creditor’s meeting, and your consumer proposal will be automatically approved. If a creditor’s meeting is required, a simple vote is held, and if more than half of the voting creditors (based on dollar value) vote “yes”, your proposal is approved, and all creditors must accept the deal. It may sound confusing, but if your trustee helps you develop a credible repayment plan, most proposals are accepted. 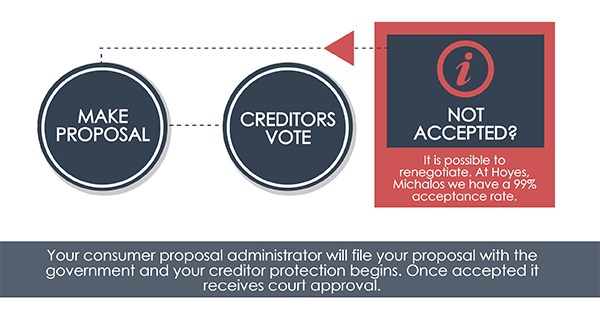 Even if individual creditors initially vote no, it is possible to renegotiate proposal terms in order to obtain enough votes to pass the proposal. At Hoyes Michalos our experience with arranging successful proposals is proven in that we have a 99% overall acceptance rate. You can pay off your proposal early. Your total payments are fixed. But, once your creditors accept your proposal terms, you can make additional payments or pay the balance off any time. The sooner you complete your proposal, the sooner the recovery process begins. You can defer up to two payments. If you fall three payments in arrears, your proposal will be ‘deemed to be annulled’. If this happens your debts are reinstated, and you lose your creditor protection. No income reporting is required. Unlike bankruptcy, you do not need to report your income and expenses every month. The fact of your completion, and date, will be communicated by the government to the credit bureaus. 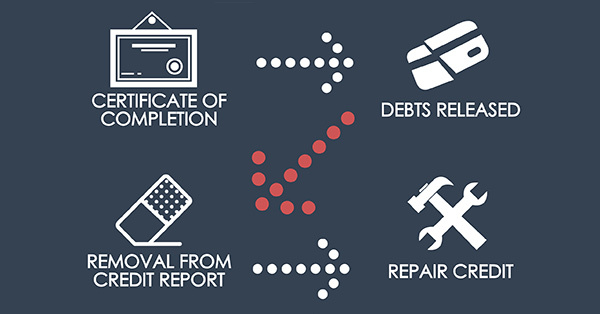 Completion of your proposal begins the 3 year waiting period to remove the notice on your credit report. 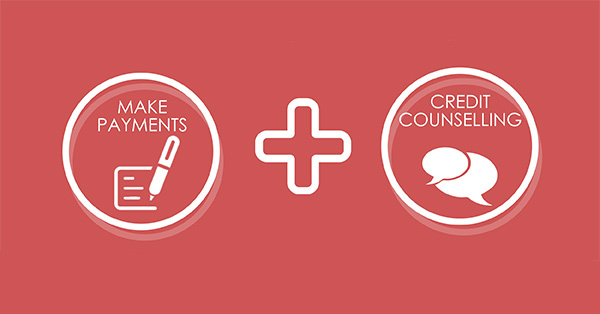 During your credit counselling sessions, you receive information on how to rebuild your credit following your proposal. For most Canadians, their proposal payments are much less than their original debt payments, so they can save money and rebuild their finances during their proposal. Once their proposal is completed, they find themselves stronger financially. Ready to talk to an expert? If you need more information about whether or not a consumer proposal is a good option the first step is to book a consultation with a Hoyes Michalos consumer proposal administrator.